2016 Triumph Daytona 675. Picture credits - Triumph. Submit more pictures. Price as new (MSRP): US$ 12000. Prices depend on country, taxes, accessories, etc. Frame type: Aluminium beam twin spar. Braced, twin-sided, aluminium alloy with adjustable pivot position swing arm. Front suspension: Kayaba 41mm upside down forks with adjustable preload, rebound and high/low speed compression damping. Rear suspension: Kayaba monoshock with piggy back reservoir adjustable for preload, rebound and high/low speed compression damping. Front brakes: Double disc. Nissin 4-piston radial mono-block calipers. Switchable ABS. Rear brakes: Single disc. Nissin single piston caliper. Switchable ABS. Instruments: LCD multi-functional instrument pack with digital speedometer, trip computer, analogue tachometer, lap timer, gear position indicator and programmable gear change lights and clock, coded key immobiliser, TPMS ready and switchable ABS (where fitted). Ask questions Join the 16 Triumph Daytona 675 discussion group or the general Triumph discussion group. Bikez has reestablished Bikez.info motorcycle web shop overview. Here we present the major online shopping possibilities for motorcycle parts, gear and accessories. This includes customizing and insurance. Search and compare products and prices. 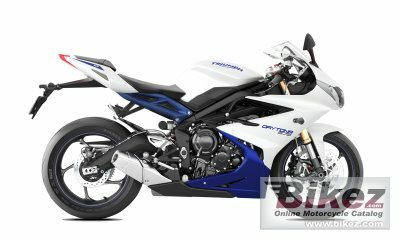 Try our 2016 Triumph Daytona 675 discussion forum if you have questions or comments. Information about any technical issue is always welcome.